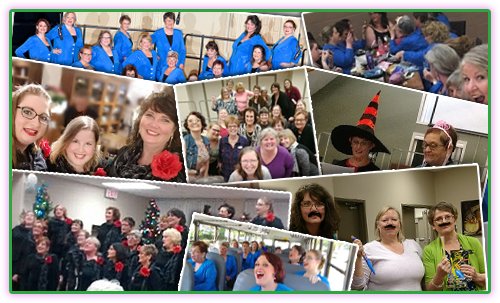 Sweet Adelines Chorus in Abbotsford BC for women from Abbotsford, Chilliwack, Mission and throughout the Fraser Valley! Singing in a chorus is a wonderful way to meet new women and to make lasting friendships with incredible women from all walks of life. Plus, there are so many physical and mental health benefits! Why do we sing? Quite frankly because we LOVE to! What do we sing? Popular music from the 1920's through to current hits in 4 part, a cappella harmony! There is something for every woman! Ladies, if you LOVE to sing and live in or around the Fraser Valley (Abbotsford, Mission, Chilliwack, Bellingham & beyond) come and join us at our rehearsals! Come out and join us - we can't wait to meet you! 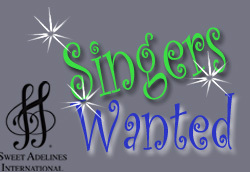 We are a member of Region 26 of Sweet Adelines International - watch this short video about our organization. We are a group of creative, talented women committed to supporting each other in our collective musical journey.